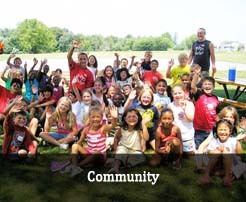 With the adoption of the 2010 Pittsfield Master Plan, Pittsfield Township became the first Washtenaw County jurisdiction to adopt an Arts & Culture Plan that articulated a vision and priorities for arts and culture in our community. 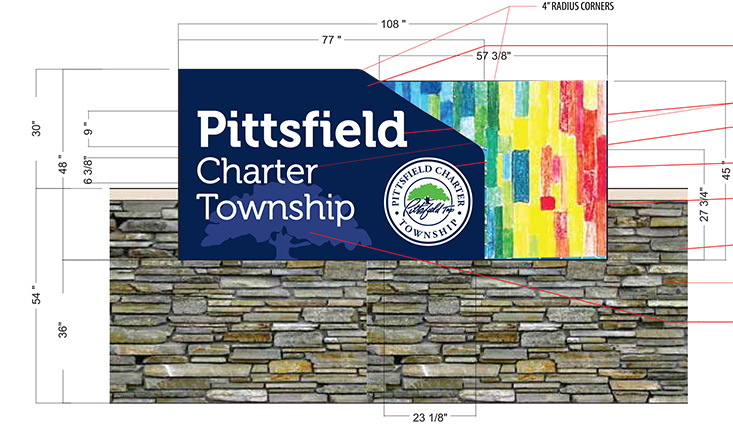 Since then, Pittsfield Township has established two historic districts, a farmers market, public art sculptures, historic markers, and transformed Township Hall’s lobby for public art display/engagement, and made strides in providing for public spaces/events that promote arts and culture (e.g., Harvest Festival and P2P). As a next step toward implementing the renewed Arts & Culture vision articulated in the 2020 Sustainable Vision Master Plan, we have begun installation of gateway signage in our community. The signs will be aluminum monument signs built and mounted on a masonry base foundation with brickwork and a sandstone cap. The signs also include a vibrant mosaic medium to reflect and celebrate the diversity of the community. 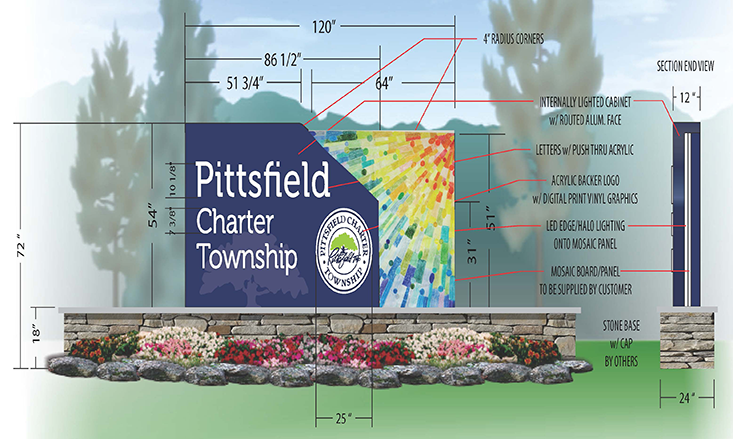 On December 14, 2016, the Township Board of Trustees approved, at the recommendation of ACEIP, the design, purchase, and installation of the first ever gateway sign to be installed on the southwest corner of State Street and Ellsworth Road (at the Pittsfield Township Community Center). The design draft shown below maintains our commitment to deploy the mosaic medium to reflect and celebrate our community’s diversity. 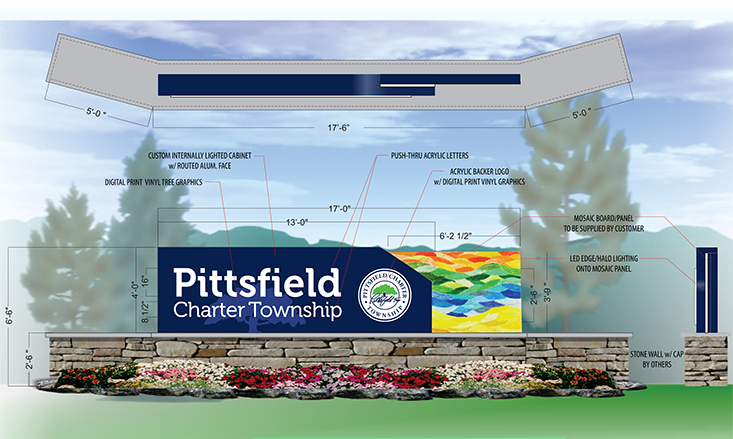 On July 13, 2017, the Township Board of Trustees approved the design, purchase, and installation of the second gateway sign to be installed on an existing retaining wall built by the Utilities and Municipal Services Department to protect utilities infrastructure on the northeast corner of Michigan Avenue and Moon Road. 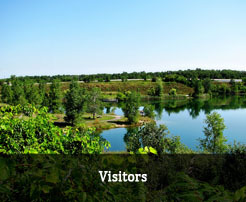 The sign was constructed on a curve and embedded into the existing retaining wall to increase the stability of the sign and preserve the overall aesthetic. 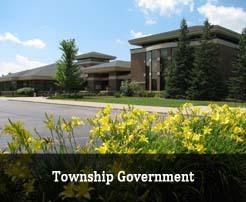 On December 13, 2017, the Township Board of Trustees adopted a resolution to accept a donation for a gateway sign along Ann Arbor-Saline Road from Oak Valley Centre, LLC. 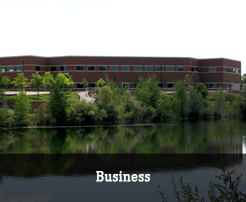 Oak Valley Centre, LLC offered to donate toward the installation of a gateway sign and allow the Township to maintain the sign in a licensed area at 2655 Oak Valley Drive.